Our Dispatching Tools Make Our System an all-in-one solution! We gives you a GPS Vehicle Tracking System, but ALSO give you outstanding dispatching tools that will help you run your fleet in the most proactive way. You will see a Return-On-Investment in the blink of an eye! 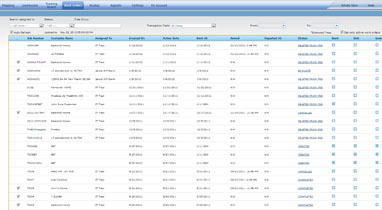 Create work orders and assign them to drivers and vehicles. View, edit, manage all work orders by changing the status whenever needed. Send work orders to Garmin Navigators and In-cabin Android solution. Drivers can receive work orders, accept them and receive turn by turn directions to the job location. Drivers can change the status of the work order and it is transmitted in real time to the dispatcher. View work orders on the map. Maximize productivity by doing more jobs with your current workforce. Increase efficiency by getting the job done, right the first time avoiding secondary visits. Improve service levels to all customers by sending all the data needed. Lower fuel costs and save time by reducing the mileage driven between job sites. Improve productivity using our Mobility Director and In-Cabin solutions. Build routes and send routes to our In-Cabin solution. View visited, delayed, not visited/skipped routes on the map. Have control over the moving of your assets in real time. Monitor various events previously programmed. plan the effectiveness of processes to improve productivity. Configure your routes according to your needs and priorities. Verify and control points defined inside the route. Improve work flow by constantly monitoring your routes visually on the map in real-time. Improve productivity by planning your trips and visits. Gain productivity and optimization of resources. Keep control of your drivers work time. 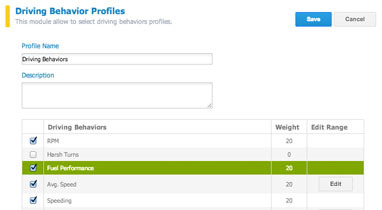 The system will read these profiles and evaluate your drivers based on them. If you set a maximum speeding profile of 55 mph and your driver constantly drives at an average of 70 mph, he/she will not get a good rating in speeding which will affect its total rating and evalution. Once you run the Driver Rating Report the system will look at those profiles and tell you which drivers are doing good and which are doing bad. Evaluate & improve drivers performance. Monitor & improve drivers behavior. Increase security on the roads. Lower fuel and operations costs. The “Dispatch Log” will make sure every important event or activity is logged and associated to a driver/vehicle. It is not new that a GPS Fleet Tracking System always records every single activity of the vehicles such as ignition on/off, driving, idling, speeding, etc… What IS NEW is that now our system lets you record activity that the tracking device cannot monitor. Think of a DIARY! That is the dispatching log. 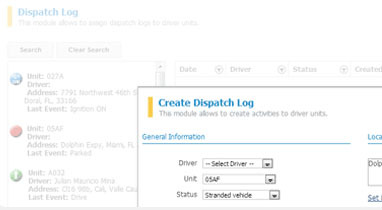 Every time that there is an important event related to a driver/vehicle, and that you want to take notes of for your history records, you can use the dispatch log to enter these events in the system and link them to that specific tracking device associated to that driver/vehicle. Avoid future misunderstandings related to particular events. Improve productivity by having key history data. 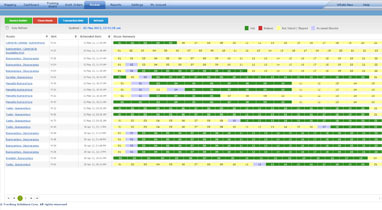 Improve management and analysis of specific situations.